The one thing I love about welcoming spring? It’s time to ease my wardrobe away from jumpers and coats to lighter pieces, punchier shades and feminine prints and accoutrements. I think there’s something great about the feeling of slipping on a dressafter months of being rugged up and experiencing that first warm breeze that indicates the changing of the seasons. I’ve been mentally shopping for my spring looks for months now and I’m so glad the time has come to start snapping up a few key additions. Here are 12 pieces that will update your look, instantly making it spring-appropriate. Want to liven up your trusty white sneakers? The classic Gucci Ace has had a starry makeover and it’s the ideal shoe option for the warmer days to come. The sharpest mules I ever did see! 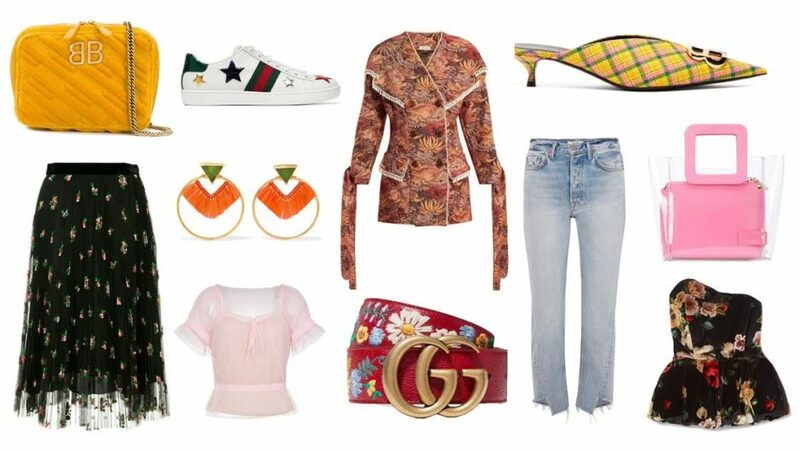 This classic Balenciaga style looks fun and fresh in a colourful check. I can stand by the versatility of the classic black Gucci belt but sometimes you just want to take it up a notch. The embroidery really makes this a fun, feminine addition to any outfit. The vibrant shades incorporated into these earrings make them the perfect go-to when you want to lift your look. Staud is one of the it bag brands to know right now. Think playful designs and colours that are anything but ordinary. A bold accent accessory can instantly brighten up any ensemble, especially in such a vibrant marigold. The texture and detail on this dress is insane. Love the statement ties on the sleeves and its nod to the traditional suit silhouette. A pleated skirt is one of my favourite style staples at the moment. The floral print on black is a sophisticated pairing that makes this piece an easy go-to for when you want to look polished. We’ll encounter a few trans-seasonal days in the weeks to come so a neutral sweater will come in handy. Team this with high waisted pieces for a chic and flattering look. There’s something about velvet that’s immediately luxe, especially when it’s paired with an adorable peplum and asymmetrical neckline. Straight leg jeans are still very much on trend and this cut is flattering on most body shapes. The soft pink and the tulle make this ultra feminine top the perfect piece to pair with slightly edgier pieces. Pop it on with a pair of jeans for a dream combination. What are you planning to add to your spring wardrobe?